Inder Loves Folk Art: Futile attempts to stay warm. Record cold temps around here. Brrrr. We are pretty sure Rebecca is quite a bit warmer than us right now - she is visiting her folks in Chicago. We hear they have this thing called "central heat" in the midwest. And this other thing, known as "insulation." Our whole house is heated by a single gas fireplace insert and a couple of space heaters. The heat seems to go straight upstairs, while the knee to ceiling Victorian single paned windows and balsa wood construction ensure that we are left shivering even when the heat is on full-blast. So we bundle up in slippers, wool socks, sweaters, and blankets and make the best of it. Adding insult to injury, our energy bill goes through the roof every winter, even while our fingers remain numb with cold. 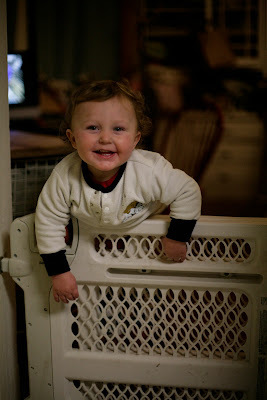 Joe stays warm by scaling baby gates in his fleece pullover. The problem with construction in our part of California is that early settlers seem to have built houses under the assumption that (1) it is never really cold here; and (2) it never rains here. Now, this is true 80% of the time - you can see how someone who just spent the winter up in Donner Pass eating frozen comrades might get the impression that Oakland is a subtropical paradise. But the problem is that (1) sometimes it gets a little chilly; and (2) every once in a while, it rains (and when it does, it tends to rain a lot). And when that happens, we are really unprepared, and the rest of the country gets to see television footage of cars submerged on Highway 101, houses sliding off cliffs, or kids surfing down Los Angeles boulevards. I can only imagine the eye-rolling that goes on in the more practical parts of the nation. All I can say is excess optimism (some would say "stupidity") has long been a defining feature of Californians. But anyway, back to our house: It's not that we haven't tried to make our house a bit more energy efficient. But unfortunately, we cannot afford to replace nine (charming!) seven foot tall windows with custom-fitted double-paned energy-efficent windows (I can't even imagine how expensive that would be). So Steve installed weather stripping on our doors, and put some of this plastic cling wrap on the windows. Unfortunately, Joe and the dogs delight in ripping it off, so poor Steve has to reapply it several times per winter and still, it has gaping holes most of the time, which probably (you think?) reduces its effectiveness. See, plastic wrap on the windows. And yesterday, in an effort to keep my fingers moving so as to avoid frostbite, I sewed up some "draft snakes" from scraps of wool, corduroy, and flannel. Trying to cover up the half inch gap between the floor and the bottom of our back door. They are stuffed with cheap pinto beans, to give them some weight and reduce the likelihood that the dogs will see them as tug-toys. Some familiar fabric. Flimsy single-pane window. How effective they are, I can't say. I'm sure they help a little, but not enough to counter the balsa-wood construction of our house, see above. I doubt this will take hundreds of dollars off our natural gas bill - it turns out pinto beans don't take the place of real insulation. But sometimes, it just makes me feel better to do something. And I was getting sick of my other sewing projects. Might be time to knit myself some fingerless gloves. I love your snakes! At least it made you feel like you were doing something useful for the problem, right? A year ago, we moved from a building that had been constructed in the 1920s, apparently before the invention of cold-defying properties. I could not BELIEVE how high our electric bill was every winter, and yet we were constantly freezing. This was with new baseboard heaters, too. I would turn the heat up to 80 to have it maybe, maybe, inch up to 58 after a few hours. 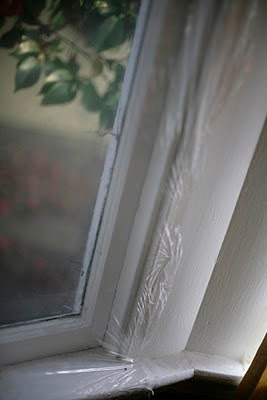 We had similar problems as you, like old-timey windows and lack of insulation and lots of gaps. The one time we got warm, we had been snowed in for a week and had the heater running that whole time. Finally, by the end of the week, we were actually toasty. So if we wanted to kill ourselves with our electric bill even more, we should have just left the heat running constantly the entire winter, never turning it off to sleep or when we left the house. Ah, well! Adorable! For the record, I am ridiculously toasty right now. I'm scared to see how chilly my room will be when I get back. Rebecca, was it as bad as you feared? Last winter I bought a 20 dollar space heater. This winter, I'm like, what winter? This 20 dollar space heater has solved every problem I've ever had. Where has it been all my life? They make great space heaters these days that automatically shut-off when a toddler tips them over. A magic $20 space heater!! That's what I need! No, seriously, please send links. Our space heaters do not do jack - or all of the heat is sucked into those high ceilings, and out of those drafty windows.